Access control systems help keep your building or office safe, especially when you have the right door hardware. Does your system need failsafe or fail secure locks on it? This depends on certain factors, such as the type of area you’re trying to keep safe. Learn more about the difference between failsafe and fail secure, so you can make sure you choose the right one for your security needs. Fail secure locks automatically lock when you lose power. These locks need power in order to open or unlock. This type of lock is the standard kind used for many access control systems. When you have fail secure locks, your doors stay unlocked unless power is interrupted. You can think of these locks as ones that ensure that inventory, equipment, and other sensitive or expensive items remain safe from intruders during power outages. In fact, these locks work best for doors to areas that contain highly valuable items, such as IT rooms or rooms containing inventory. If there is a power outage in your building, the doors to these areas will automatically lock, which helps prevent unauthorized entry. 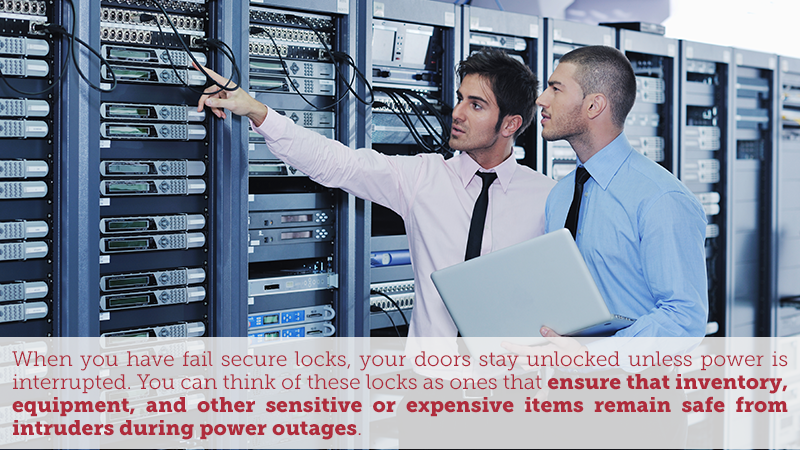 Failsafe locks open when you lose power. These locks need power in order to lock or secure your door. This type of lock is commonly used for doors where building occupants might need to make a quick exit for emergencies, such as fire exit doors or doors to stairwells. When the power is on, these doors stay locked. You can think of these locks as ones that ensure that no one’s life will be in danger if a power outage occurs. Keep in mind that fire exit doors are required to have failsafe locks rather than fail secure locks. When deciding whether or not you should get failsafe or fail secure electronic or magnetic locks for your doors, you’ll need to consider a few factors. For example, during a power outage, would a locked door endanger lives? Would an unlocked door put equipment at risk of theft? Remember that egress doors, such as fire exits, should have failsafe locks, while most other doors in an office or building, such as the front office door or the door to the IT room, should have fail secure locks. Another factor to consider is energy usage. Failsafe locks need a constant supply of power in order to remain locked, which means they can cost you more money. If you’re having trouble determining which type you need, consulting a professional locksmith can help. Need failsafe or fail secure locks for your business? Contact a Flying Locksmiths locations near you today.